Leave it to this drama lover to think that the new film The Incredible Hulk is more boring than Ang Lee’s Hulk from 2003, despite the fact that the entire world hated that version because they said it was too slow. Maybe it was the departure in genre tone that Lee brought to the movie, making it a psychological tale of humanity rather than an action, comic-book romp, but I was pleasantly surprised after thinking it would just be Hulk-Smash over and over again. The funny thing is that knowing this new variation, from Transporter director Louis Leterrier, would be action packed, destruction heavy chaos, I was all for it. I liked the original film and wasn’t quite sure this reboot was totally necessary, but I have to admit I was excited to see some fights, especially after hearing the end battle lives up to the hype, something that lacked in Iron Man and Batman Begins. Unfortunately, while the scuffles were pretty hectic and a lot of fun, everything else, most noticeably the middle third, dragged. It could be that the extremes were too far apart, leaving the testosterone-laden mini-warzones to go to scientific computer speak or blatant sexual tension between the past loves of Bruce Banner and Betty Ross, but I think it was just that those slow moments were too long and not the forte of the filmmakers. Leterrier handled the mix of drama and action much better in Danny the Dog, possibly due to the writing from auteur Luc Besson. Maybe it was Zak Penn’s script, possibly it was the extreme highs of the fights creating even more extreme lows, either way, to me, Hulk was more consistent and a better film. That’s not saying this new installment is bad; it has a lot going for it and if nothing else shows that the subject mater is still viable for a third film featuring The Leader as a villain. If you thought that you should be familiar with the first film before bothering here, you will be glad to know it’s unnecessary. The credit sequence shows how Banner infects himself with gamma radiation and what happens to make him leave the country as Betty and her General father recover from the aftereffects. Nothing about the past army base history of Banner’s parents or Nick Nolte’s electricity love is alluded to or acknowledged. This film is a reboot through and through, just pretend the first never existed, it’s what the filmmakers do. Basically, the exposition is glossed over—his experiment causing the infection, his inability to survive with it while amongst the ones he loves, and his self-imposed exile to Brazil in order to look for a cure—all relayed in the first twenty or so minutes. The action really starts once General Ross catches up with his former employee and love of his daughter as he attempts to extract him back to the US. 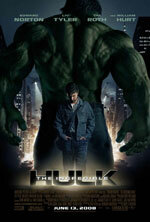 This mission expedites Banner’s return for a cure and his crossing paths with Betty once again, as well as an encounter with the Russian-born Brit military man Emil Blonsky, whose craving for a fight and infatuation with the power he sees coming from the Hulk makes him decide to do whatever it takes to acquire that strength for himself. So, this film is really just an extended attempt to capture Banner as he tries to cure himself, (oh and the fact that we believe he might be cured for only ten seconds before they completely disregard that whole plotline in order for a war to break out is just one of the many failures of plotlines that could have been very interesting). At the end, we really find that we are in the exact same situation we were in at the start—except now Betty knows her Bruce is alive. While the story may be lacking, the action is not. Tim Roth, as Blonsky, has a wild fire raging behind his eyes. The guy will not give up, despite any odds piled against him. When he takes a taste of the gamma poisoning in order to even the playing field versus the Hulk, you just know that small sample will never satiate his lust for blood. Super-Roth goes against the green giant and it is pretty exciting, even the sonar cannon effects are cool to watch as they attempt to stop the monster. The final battle is a lot of fun with destruction, but it is the chase scene in Brazil that sticks to mind after leaving the theatre. Brazil’s cityscape is ripe for an extended sequence with its housing and factories all jammed packed together on a hillside with barely room for a street between them. Banner and Blonsky run after each other while extras from Bruce’s job crop up with a bad attitude. The first transformation finally occurs, yet most of it is seen from the shadows. A brilliant use of deflection helps make the chase more exhilarating than the computer generated fight at the finale—no matter how much fun that still ends up being. The boring, drawn out exchanges between action set pieces may ruin the pacing and enjoyment, but to me it is really the new cast at fault. Whether you liked Lee’s version or not, you shouldn’t be able to question the actors involved. All those onscreen here pale in comparison and probably cause the mediocrity of those scenes. Liv Tyler’s whisper doesn’t have the same panache as the strong-willed Jennifer Connelly, William Hurt’s overacting to be the hardass can’t touch Sam Elliott’s natural born proclivity to that demeanor, and, no matter how much I like Ed Norton, Eric Bana hit the conflicted internal struggle emotive quality out of the park in Hulk. Maybe if the old cast was brought into this film, the parts that fail could have worked and rather then bring down the smash and grab moments, could have enhanced their success, making the enjoyment level higher and the film better as a result. Copyright © Universal Pictures. All Rights Reserved. Tim Roth as Emil Blonsky in Universal Pictures’ The Incredible Hulk (2008) Copyright © Universal Pictures. All Rights Reserved.